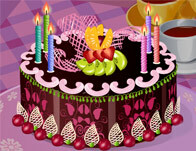 Bake a delicious cake for your best friend`s birthday party. Surprise your friends by hosting a party at your place for him and invite many kids. Your delicious crazy cake will be your final present. Enjoy!